If you’re looking to do more than simply update a few backsplashes in your kitchen, you’ll want to call on Alleva Construction and let our experienced electricians, plumbers, and builders use their skills to revamp your current space. From the design stage to final construction, the experts at Alleva Construction will ensure that your kitchen remodel project is as streamlined and simple as possible. The first step is to schedule an appointment with a member of our staff and our professional kitchen designer. We will take measurements and determine the best use of the space. The possibilities are endless! Most kitchen remodels require building, electrical, and plumbing permits. We handle this entire process. Having a licensed builder, plumber, and electrician will ensure that your project is done safely and will meet all the municipality requirements. 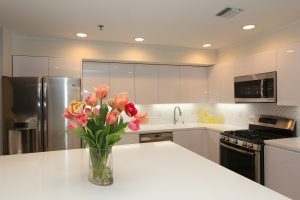 Need Kitchen Design Services for Your Hackensack, NJ, Home? Consider Alleva Construction! Alleva Construction, Inc., offers professional kitchen design services that can help turn the dream kitchen you’ve been envisioning for your home into a reality. As a full-service design-build firm, we have been offering comprehensive home design services to residents of Hackensack, New Jersey, and nearby areas since we first opened our doors in 1987. When you turn to us for kitchen design services, our consultants will discuss the many different possibilities available to you, from updated backsplashes and cabinetry to entirely new flooring and lighting. Our 3D designers will then share their design ideas, which can be tweaked until they perfectly match your vision. Once you are completely satisfied with your kitchen design and ready to begin construction, our skilled team of builders, electricians, and plumbers will renovate your kitchen with precision. Better budget management – We will discuss a realistic budget during the design stage and our team will monitor the progress throughout the project to make certain that we stay within the specific budget. Faster project completion – With a single company handling your entire project, communication becomes much easier, helping us ensure that your home renovation is completed on time. Quality control – Being involved in every step of the process allows our team of designers and technicians to avoid any confusion about which materials are meant to be used and what the homeowner’s vision is. If you would like to learn more about the exceptional kitchen design and construction services Alleva Construction provides, contact us today to schedule a consultation at your home in the Hackensack, NJ, area. When you do, be sure to inquire about our numerous financing options. We work with you to create your dream kitchen on any budget.